Looking to buy from a selection of in-stock, finished materials? The lapping process is used to provide flatness, parallelism, thickness identity, and surface finishes to extremely demanding tolerances. Centerline uses both mechanical and chemical mechanical process (CMP) to meet the polishing needs of our customers. We specialize in making filled via's co-planar with surface substrate. Centerline offers diamond machined edges, bevels, V grooves and chamfers per your specifications. Centerline can laser drill, scribe or cut a variety of substrates to your specifications. Centerline develops processes for different materials, such as ferrites and glass interposers. Centerline sells a variety of materials in different sizes. If we don't have what you need we're willing to help you find it! We have compiled many useful resources to help answer your difficult questions! We take pride in seeing our customers accomplish great things and we recognize that it can’t be done without great parts. 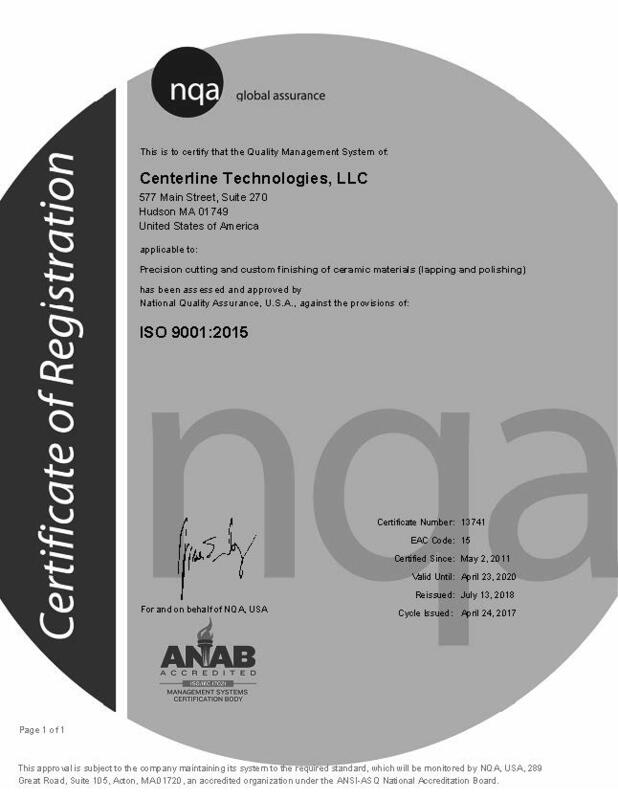 At Centerline, we dedicate ourselves to your success by providing the best services possible.